Releasing a defining album is a pretty nice way to celebrate hitting age 50. If it's a particularly solid outing, so much the better. 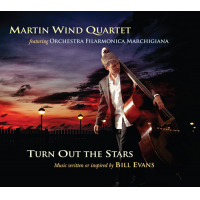 Martin Wind's milestone comes as he also marks 25 years as a recording player. It seems faintly miraculous that there's really time for him to do his own thing, considering that he's busy as ever juggling teaching work and myriad bass gigs, but he's nonetheless assembled an excellent lineup of colleagues and mostly-new compositions to celebrate at a peak. Though it's just a hair too long to fit on an actual single piece of vinyl, the disc splits its running order into LP-style 'sides' with their own complementary feels. The Light half is handled by the leader's steady quintet (with Scott Robinson, Ingrid Jensen, Gary Versace and Matt Wilson), which feels like an even bigger band than that from the amount of ground they cover. There's something of a party vibe straight from the big-band-style opener, buoyed by Versace's warm organ and a spry solo from the leader's resonant strings. The running order alternates these romps with a pair of lovely ballads, both featuring smooth-swaying dual horns and some sweetly tasteful backing from the rhythm section. Nice as those are, it's the catchy pieces that show the heart of this celebration. The jump-and-jive of "Ten Minute Song" features an infectious clarinet cameo from Anat Cohen, who naturally brightens everything she touches (the mike even captures some stray laughter during the take, a nice spontaneous touch). "Power Chords," meanwhile, actually gets most of its power from a driving drum groove underpinned by Wind's slinky minor lines. Rounding it off are a dose of spiky bass saxophone and angular organ stabs almost suitable for a cinema horror score, though the results here are raunchy-fun rather than anything scary. Side B is (of course) subtitled Blue, but doesn't stay that way too long. This half changes to a different lineup"a new group of old friends," as the blurb has itand makes a figurative shift to South America. Cohen's reed work and Maucha Adnet's earthy voice bring the bossa nova with sultry elegance, always with Duduka Da Fonseca and Bill Cunliffe stirring the rhythmic pot with flair. Adnet is particularly poignant in revisiting "A Sad Story," a piece from Wind's earliest days as leader, this time presenting its poetic sentiment in both Portuguese and English. Even the album's most melancholy moment still finds a silver lining in the closing line "love will always shine," as the chords shift to a cautiously optimistic major. 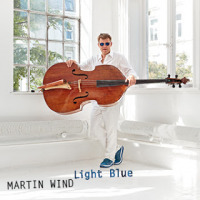 Once "Longing" sambas to a wistful and yet uplifting close, Martin Wind has given us a richly colorful listen to soak in and savor. May he and his music only continue getting finer with age. Track Listing: While I'm Still Here; Rose; Ten Minute Song; February; Power Chords; A Genius and a Saint; Seven Steps to Rio; A Sad Story; De Morte a Sul; Longing. 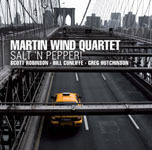 Personnel: Martin Wind: upright and acoustic bass; Anat Cohen: clarinet; Ingrid Jensen: trumpet; Scott Robinson; alto sax, bass sax, tenor sax, taragota, clarinet; Maucha Adnet: vocals; Bill Cunliffe: piano; Gary Versace: piano, organ; Matt Wilson: drums; Duduka Da Fonseca: drums.